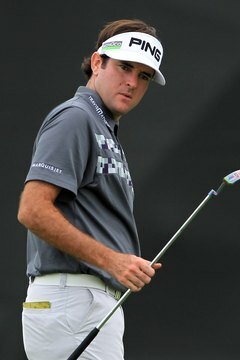 PGA Tour pro Bubba Watson uses a Ping putter. The current crop of Ping putters (2009) features six different lines each with a variety of unique features that should appeal to different golfers and putting styles. Nearly all are made in some of the more popular and even classic Ping styles while a few, the iN series in particular, feature more unusual or even experimental shapes. All of the Ping models feature the famous heel-toe weighting system developed by Ping founder Karsten Solheim in 1959. Prices range from about $100 to $200. With 10 different models weighing in at between 345 and 480 grams, this line features some of the most unusual shapes and names, including the Whack-E and the Craz-E. All 10 are made of stainless steel with nano-nickel face inserts and a medium-firm face response. Most unique in this series of six styles is the interchangeable weight system that allows you to move more weight to the front, back or even top of some of the putters. All the putters in this series have a two-piece steel face insert set in a urethane base. If Ping can ever be called traditional, this is the most traditional of the offerings this year. All six are made with precision-milled faces of 303 SS stainless steel. Named after Ping's original home in Redwood City, California, these are the putters that compare closest to the Titleist Scotty Cameron line. Designed with vibrant orange graphics, this series of 12 models is almost as unique as the iWi series. With a medium-firmness urethane insert in a stainless steel clubhead, all these putters feature both traditional and optigraphic alignment aids. Named for Ping founder Karsten Solheim, this batch of seven different styles is a classic stainless steel design with a firm sweet spot and no face insert. This group leans toward being a throwback to the most popular Ping designs of the 1980s and '90s. With only two models, this is the most extreme perimeter weighting from Ping this year. Face balanced with a nano-nickel insert, the JAS is heavy at 355g and shallow at only 2 degrees of loft but stable at the end of a traditional-length shaft.